Sterling Silver / 14K Yellow Gold Diamond & Tsavorite Panther Ring 0.1435 ct Price includes 30% discount. A dazzling display of dramatic brilliance. 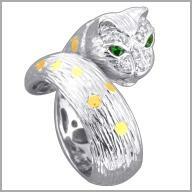 This panther ring is crafted in polished and satin sterling silver with 14K yellow gold accents. It features 10 full round cut diamonds in prong settings and two round cut 1.8mm tsavorite stones in channel settings as the eyes.The total diamond weight is 0.15ct and the total tsavorite weight is 0.08ct (both approximate). The diamond color is H-I with a color of H- and a clarity of I1. The setting size is 11/16" x 7/8" with a height of 3/8".